Yesterday I mentioned that my short story The Merrow Cave has been published in issue 34 of Canadian literary journal Querty Magazine. The source of the original story began with me glimpsing this beautifully serene carving at the abbey on the Scottish isle of Iona. 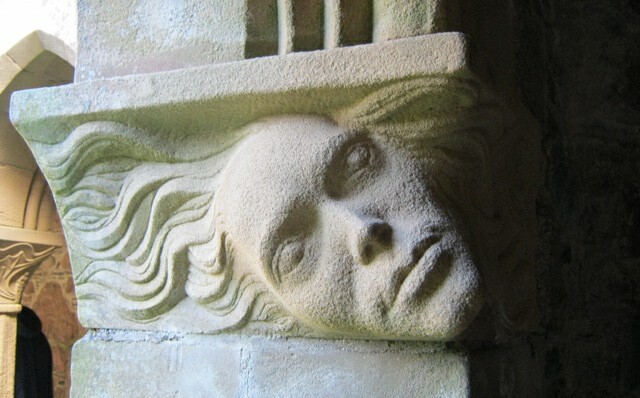 It’s an incredibly tranquil place, and this face encapsulates a sense of the atmosphere. For the purpose of my story I relocated the carving from the column of an abbey into a cave on a shore, and made it a symbol of love. I invite you to do something similar. Place the carving, or a similar one, somewhere meaningful and insert it into a tale. Who is this person? What merited them being immortalised in this way? Who might stumble across it and how might they react?